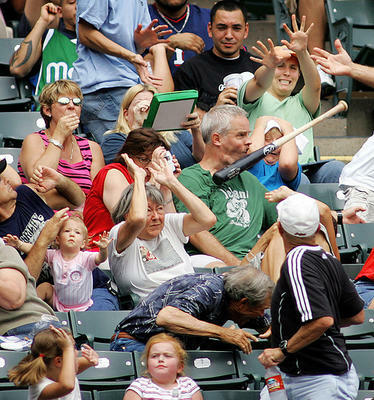 I know it’s old, but I’m still amused by the fact that the dude that got hit is literally the only person in this photo who did not react to the bat flying at the stands. Unless you count the reaction of his grill getting mushed. From out of nowhere, it’s naptime! His jaw does not look like it’s going to be alright at all. Does anyone know the story behind this? yeah, his jaw is fuxored. i see this all the time in females, because i have a hueg penor. srsly, the girth is massive. What’re you doing whacking them on the side of the head with it, Nate? It’s supposed to go in their mouth — then all they have to contend with is a simple dislocation! Green shirt woman is using the power of raptor jesus to stop it. Not. Blue shirt kid just loaded up the draws. Blue shirt guy is playing quarterback. Down syndrome redhead girl is oblivious. Old lady next to jaw surgery guy is throwing her hands in the air like she just don’t care. And the little kid next to hear is pleading “me next!”. The blonde right behind him is using her food to protect her face. LOL! Guy with the black shirt has the best expression. He is only 2 rows away and he looks completely unconcerned, kinda smirking.